The impressive stone fortress of Castle Sween stand on a rocky outcrop on the south eastern shore of Loch Sween. The loch narrows slightly here, and the castle was clearly built to command its entrance. To the south west the castle looks out of the mouth of the loch towards Jura and Islay. It is believed to be one of the earliest surviving stone castles in Scotland and is, perhaps because of its very remote location, in a surprisingly complete condition. You reach Castle Sween along the minor single track road that turns off the B8025 to Tayvallich at the head of Loch Sween, before making its way parallel with the shore. En route you pass close to Inverlussa Church, and it is worth looking out for a cross slab standing in a field next to the road a mile north east of the castle. It is also worth remembering that, having travelled this far along the side of the loch, you should not return without also visiting the wonderful carved stones at Kilmory Knap Chapel, a couple of miles further south west. You know you've reached your destination when you see a turning on the right that leads over a cattle grid and downhill to the Castle Sween Holiday Park. Signs at the junction (and more in the holiday park itself) emphasise that visitors to the castle should leave their cars in the pull off area beside the main road and walk down to the holiday park and to the castle beyond. It's a walk of only about a third of a mile, and having arrived in the holiday park you walk past the buildings in front of you to find the gate in the wall surrounding the castle itself. Given how seriously remote this part of mid-Argyll, known as Knapdale, actually is, it is rather a pity that the best and most important castle for some distance in any direction has been wrapped around on its landward side by a holiday park. Things could be worse, however, as the development does not encroach too closely on the area of the castle itself. But we visited on a day when the park seemed deserted and suspect that the brooding atmosphere of this place might not stand up well to the presence of large numbers of happy campers in the immediate area. Truly authoritative accounts of how Castle Sween came to be here do not exist. However the mainstream view is that at some time in the late 1100s a local lord called Suibhne chose to build a roughly rectangular castle of enclosure here. This comprised four massive stone walls and, almost certainly, interior ranges of wooden buildings. 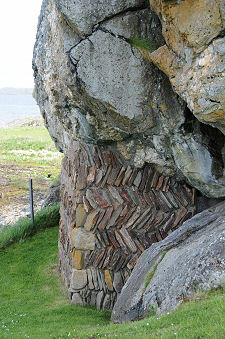 The large external buttresses that help support the walls are typically Norman in style, and unique in Scotland. The site was one that would have allowed the longships of the day to be pulled up out of the water in the shelter of the castle, and from a base like this an energetic lord could have made his presence felt over a considerable part of mid-Argyll and the southern inner Hebrides. Suibhne is sometimes referred to as Sveinn or Sueno, and accounts differ as to whether his ancestry was Norse or Irish (though the two are not necessarily mutually exclusive). He does appear to have gone on to become Lord of Knapdale and is generally regarded as the founder of Clan MacSween and Clan Sweeney. By the early 1200s the MacSweens controlled lands on or near the coast of large parts of what is now northern Argyll. However, in 1262 the MacSween lands in Argyll came under the control of the Stewart Earls of Menteith. 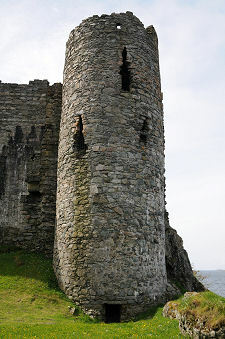 They expanded Castle Sween by adding an external range to its north western side, overlooking the loch, complete with two towers. During the Wars of Independence the MacSweens sided with the English in return for a promise that the lands taken by the Stewarts would be returned. This led to their landing on the nearby shore and besieging the castle. The recapture of Castle Sween by the MacSweens was only a temporary one. It was subsequently besieged and captured by Robert the Bruce, and having backed the wrong side, the MacSweens were never going to do well out of the relative peace that followed the Wars of Independence. 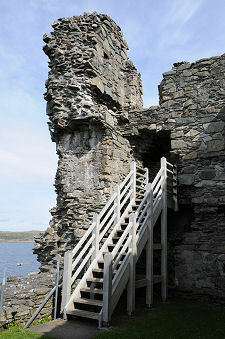 Robert the Bruce granted the MacSween lands, including Castle Sween, to his loyal supporter Angus Óg of Islay, father of John MacDonald of Islay, Lord of the Isles. The MacDonalds appointed the MacNeills to be hereditary constables of Castle Sween, and this arrangement seems to have been in place for a considerable period. 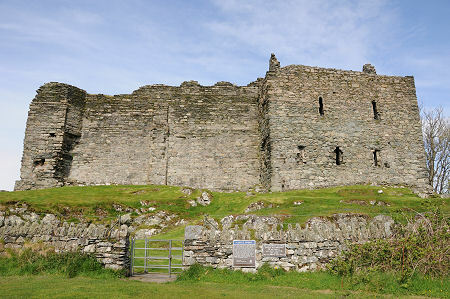 Hector Torquil MacNeill, 1st of Taynish, died in about 1450, and left control of the castle to his daughter, Erca. She subsequently married Alexander MacMillan and the couple embarked on the last major addition to Castle Sween, the large keep which projects from the north east corner of the castle, and which is known as MacMillan's Tower. They also appear to have built a large east range occupying much of the eastern half of the present courtyard. The MacDonald Lords of the Isles were stripped of their lands and properties by King James III of Scotland in the 1470s, and in 1481 the Crown appointed the Campbells to be keepers of Castle Sween. In 1647 Alasdair Mac Colla, the military leader of what might be described as the Irish arm of Clan MacDonald, attacked Clan Campbell lands in Argyll as part of the Royalist campaign in the Wars of the Three Kingdoms (see our Historical Timeline). The castle was badly damaged and was apparently not returned to military use. It does appear to have remained in use for other purposes, however. Archaeological excavation of part of the east range in 1989-90 uncovered evidence of industrial use, including a forge and kilns. It seems unclear at what point the castle finally fell out of use. When Castle Sween was visited by David MacGibbon and Thomas Ross, the authors of a definitive guide to castles published in 1892, they found it to be heavily overgrown and long out of use. As already noted, today's visitor enters the precincts of the castle by means of a gate in the wall separating it from the holiday park. The main gateway to the castle itself is set in the middle of the south west wall, and as you pass through it is worth wondering at the sheer effort that was needed to build walls this substantial in this location rather more than eight centuries ago. 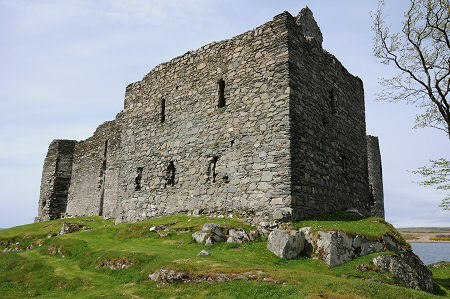 The large courtyard gives a good impression of the interior of the original castle, though it is worth remembering that much of the space would have been taken up by wooden ranges of buildings, providing accommodation for the laird, his family and retainers, as well as a great hall and service buildings. A partial low level wall parallel with the south east side of the castle gives an idea of the scale of the stone east range added in the 1400s. 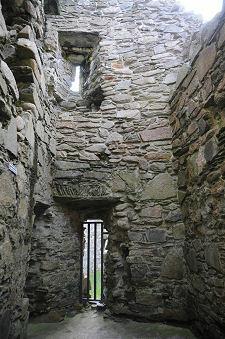 If you head across the courtyard to the far right hand corner of the castle you pass through into the MacMillan Tower. This is a hollow shell from basement to rooftop level, but there is plenty of detail left to give you an idea of how it might once have looked. Traces of stone vaulting above the basement show that the first floor hall would have been stone floored. Meanwhile, the basement itself comes with an apparently complete bread oven, and a water supply via a spout set into the kitchen wall. On the seaward side of the castle you pass through the original enclosing wall and into the areas added in the latter half of the 1200s. The activities of besiegers and/or coastal erosion mean that the south westernmost parts of this have largely disappeared, but the impressive "north west latrine tower" does remain in a very good state of repair and can be accessed by climbing a wooden staircase. It is at about this point that you begin to realise that various builders of Castle Sween appear to have taken an unusually generous approach to meeting the toilet needs of those who lived and worked here. Having an entire tower - to judge from its name - given over to latrines appears to be overkill. Even odder, a walk around the outside reveals that the main outflow is not, as you might expect, into the sea, but onto what looks as if it was always dry land. More latrines were made available in the north east wall of the courtyard.